I love this cat!! I don’t care whether it is DLST or EST (I checked to see what time he took his nap after we moved the clock back--yep it was 4 :30!!!) raining or hot and humid, whatever, he takes his nap around 4:30 every day!! If I didn’t know better I would think he was a senior citizen resident of Gateway--the old folks here take their nap around 4:30 PM!! The pictures in the four slideshows were taken in September, October and November--you don’t need a watch!! 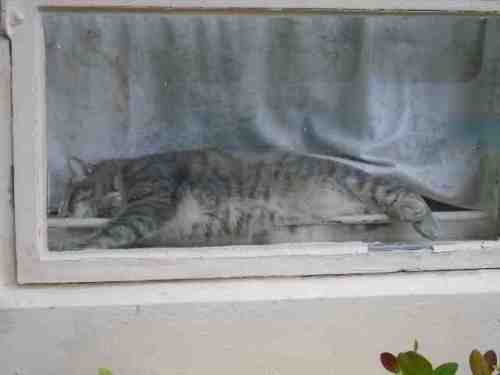 Check by the window and if he is asleep in the window you know it is nap time!!!! I had posted one previously but I made a mistake posting it and no one could see it as I put it with these and that one isn’t all about the cat but just more sides of him! Like people, cats get into a routine and don’t you dare get in the way! If you have ever tried to get a senior to do something at nap time there will be hell to pay--same with a cat!